Now start cashing in on covered calls! For more information on rolling strategies see pages 277-292 of my latest book Alan Ellman’s Encyclopedia for Covered Call Writing and pages 95-109 of Exit Strategies for Covered Call Writing. Consumer credit rose to $7.4 billion in September, more than expected but not enough to counter Augusts’ decline of $9.5 billion. Consumers are still concerned about unemployment and a sluggish economy. For the week, the S&P 500 rose by 1% for a year-to-date return of 2.3%, including dividends. BCI: There is no change in our position of being cautiously bullish, fully invested and favoring in-the-money strikes. This has been working well as the VIX is at the “30” level, barely within our comfort level. Thanks for another informative article. Any reason why you didn’t consider the 49 strike price? This would have generated the largest return. Would you wait until Friday to roll forward. I’m on a business trip Fri and may not be able to get to the computer and rolling by phone is not easy? Does the extra time of the forward option generally compensate for the fact that I;m not rolling on Friday? You are right. There are other strikes to consider. I decided on the two that I thought would be most useful in explaining the strategy. As a rule, when we role out, we do so to an in-the-money strike as in the above article ($48 is in-the-money compared to the current market value of $49.07). When we role out and up, we can do so to an in-the-money strike, an at-the-money strike or an out-of-the-money strike. This will depend on the relationship of the new strike price to the current market value. In this case the $49 strike is a near (at)-the-money strike. These always will generate the greatest intitial time values or ROOs. For “newbies” it is always a good exercise to calculate as many different strikes as possible. It will not take long and will go a long way to teaching the association between different strikes and when to select them. Yes, the extra time value spent on closing the original short position will be negated by the additinal time value generated from the new short position. This is a non-issue if you roll the option a day or two prior to expiration Friday. That’s why I use the phrase “Exit Strategies on or NEAR expiration Friday”. Have productive business trip. What is the date next to RHT in your first chart and why are some of those dates in red? 3 weeks ago I sold the november 50 strike price for dsw. Today it is above 51. Since there is an earnings coming out on the 22nd, is there any action I need to take if the strike is still in the money by Friday? So far its a 3.4% return in 3 weeks. This is one those of judgment calls only you can make. The ask price at Friday’s close was $2.05, almost a full dollar over the closing price of the stock at $51.07. It does look like there is some belief that the earnings will be good because it jumped $2.65 on Friday alone. Since the 19th is the Friday before the earnings come out, you should remember that there is sometimes a runup in anticipation of a good earnings report. Perhaps the stock will hold above $50 through next Friday. However, you should also remember that sometimes the market realizes the runup may have been overdone, and it starts it come down just before the earnings report. There is no easy answer. If you have a decent gain, it might be wise to protect it and get out a little early. If you really think the stock will stay up there (it spent the entire month of July above $50) then you should consider holding it until Friday, but keep your finger on the sell trigger. That’s my two cents worth. Owen. The dates adjacent to the watch list stock tickers represent the projected upcoming earnings report dates. Those dates that are bolded in red are the ones that have been confirmed on the earningswhispers.com site. Owen thanks for the explanation. The Weekly Report for 11-11-11 has been uploaded to the Premium Member’s website. All of the stocks I have that expire on Fri are no longer on the Passed all screens list. They are all in the money. Do I let them all go and buy new ones next Fri? Or roll them? Suggestions anyone – this is the hardest part. Evaluating your current situation is a great exercise for all those who are honing their covered call skills. First, let me say that with ALL your strikes in-the-money, you must be doing something right! 1- If an earnings report is coming out in the December contract, allow exercise so your stock will be sold. 2- If a stock has mixed technicals but passed all other screens, it is still eligible. In these instances if you still like the stock and the returns (“what now” tab of the calculator as shown in the article above) you may want to give consideration to rolling out and preserving the downside protection. 3- If a stock is in the pink cells, but NOT taken off the list (final section of the weekly report) you can check the first 3 pages of the report to see where it failed initially. If it failed in the second from final screen (confirming indicators: MACD and Stochastic oscillator) these stocks can whipsaw back into the white cells next week. You can follow this during the week. 4- If a stock has failed an earlier screen (risk/reward, chart pattern) you should be less inclined to stick with it. 5- When in doubt, allow assignment and go with a stronger financial soldier. You are currently in a great position with all strikes in-the-money. Once again, I encourage members who are in the process of mastering this great strategy to assess Frank’s stocks or your own as we approach expiration Friday. Will you always buy back an option if it trades at parity? Almost always. For those new to options, when an option trades @ “parity” it trades at all intrinsic value and no time value. For example, if a stock is trading @ $55 and the $50 strike is trading @ $5, it is said to be trading @ parity. It will then cost only commissions to close the short position, sell the stock and use the cash to generate a second income stream in the same month. If it’s too close to expiration Friday to generate a meaningful second income stream closing the entire position will ensure maximum profit. The stock in this article RHT is at 53 today. If you rolled to the 48 strike could this also be a good candidate for the mid contract unwind exit strategy? 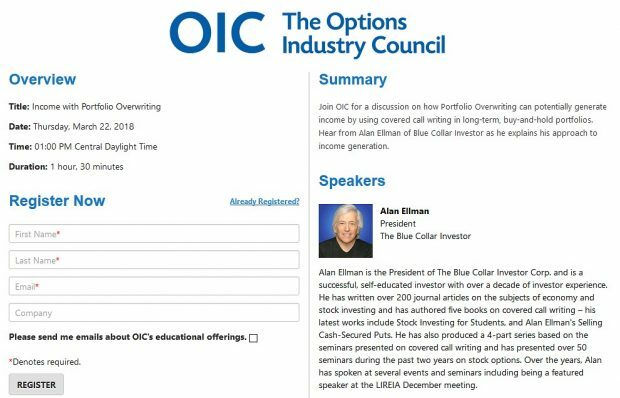 You are now officially a true Blue Collar Investor! I love it. You are absolutely right that when a stock moves up significantly and quickly our first thoughts are to generate a second income stream in the SAME month with the SAME cash. Although RHT isn’t there yet, we are ready to act. When the time value approaches zero as the strike goes deeper in-the-money we look to invoke the “mid-contract unwind” exit strategy…one of my favorites. Even if it turns out that we don’t use it in this case, by being prepared it will open doors for other opportunities in the future. For those members who have copies of my latest book check pages 264-271 to review this strategy. Why aren’t options available for all stocks? I’ve heard that year end pension funding bodes well for the stock market in December. Any thoughts? Stocks must meet certain exchange requiremnets to have options listed. Many “experts” feel that Thanksgiving marks the start of an early “January effect”, a month generally considered favorable for the stock market. Year-end pension funding is considered one of the reasons for an early boost to the market. However, this year’s conclusion seems to be hostage to the global issues that have caused all this recent volatility. How do I calculate the cash I would need if I traded my covered calls in my margin accounts? I just rolled my 70 option on TSCO. I closed the November 70 @ $2 and opened the December 70 @ $4.20. That’s 3.1% initial profit with 2.8% protection. Good deal if market holds. ← What is “Left Tail Risk” and How is it Impacting our Stock Portfolios?